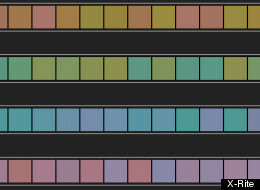 The X-Rite site has a new, nifty Hue Test they’ve developed. They report that 1 out of 255 women and 1 out of 12 men have some form of color vision deficiency. Their online color challenge, based on the official FM100 Hue Test is a fun way to see how well you see hue and value across the spectrum. Rearrange the squares in order of hue and then click on the “score test” button to see how well you do! Zero is a perfect score.